Location: 35A Station Street, Mt Victoria NSW 2786, Australia. 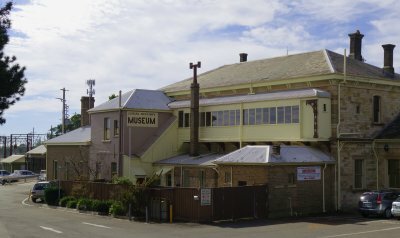 The Museum is housed in 16 rooms including the old Refreshment Rooms at the rear of Mt Victoria Railway Station. A diverse collection with exhibits on two floors in the heritage listed sandstone building, circa 1884. Opening Hours: weekends, public & school holidays from 12 noon to 3pm. Closed Christmas Day and Good Friday. The Mount Victoria and District Historical Society celebrates 150 years of railway to the village by holding an exhibition commenced on the first Saturday in May 2018. This date commemorates the Governor’s arrival by train on 1 May 1868 to declare the line open. The exhibition takes the form of a photographic and other media display (giant Train Drivers Union Banner, digital projections, touch screen oral histories) relating to the railway with text describing the impact over the years of the railway to the village of One Tree Hill as Mount Victoria was originally known. The exhibition will be on display until 31st January 2019. Normal opening hours 12-3pm Saturdays and Sunday. Open every day school and public holidays. The museum is open every day of the school holidays from 12 to 3 pm. Guided groups, coach parties and educational visits can be accommodated at other times by contacting the President or Publicity Officer (see contacts page). Admission: Adults $5, Children $1. Donations welcome. Access: Level access from car park and railway platform; suitable for wheelchairs. Wheelchair access to the ground floor only. The main entrance is at the rear of the building behind the station platform. Check our Facebook page for up-to-date info. Find us here — right at the train station in Mt. Victoria.